Welcome back to the June Virtual Book Club for Kids. This month we are celebrating the author Eric Carle. We've been exploring many Eric Carle books and recently completed a Reading and Writing About Insects Unit featuring Carle's books. This month, I decided to focus on building vocabulary. Vocabulary is one of the five components of reading instruction. It's super important! In fact, many studies have shown that a preschooler's oral vocabulary is the best predictor of future reading success. It's also important for my soon to be first grader to build his vocabulary. I feel that vocabulary instruction needs to happen in a constructivist approach. This means, I like for my boys to experience vocabulary in authentic texts and make generalizations about the words. Together, we talk about the words, apply the words, and firm up their working definitions of the words. It just makes sense that oral language skills should be built through conversations about words. However, vocabulary instruction does not have to be boring! We found a great way to practice the vocabulary from our Eric Carle books by playing a night time vocabulary word sort game. This month we chose to focus on Eric Carle's book, The Very Lonely Firefly. One summer night, a very lonely fireflies goes to search for firefly friends. He sees many lights in the night sky such as owl's eyes and headlights, but it takes him several tries to find his firefly friends. Who hasn't spent a summer night collecting fireflies into jars? We decided to play off that old tradition by collecting vocabulary words into jars. I began by creating a word board. I used a black piece of paper decorated as a night sky with word cards placed on it. We've been reading several of Eric Carle's books about insects. My first grader also finished up an insects unit at the end of the school year. It seemed like a good choice to sort words by insects and land animals. I provided two jars to sort the insects and land animals. These are the words I wrote on the cards that I attached to the black paper. To play the game: chose a word, read it (or I read it to them) and deposit the word into the correct jar. This is a great game to play outdoors in the evening, perhaps while you wait for the fireflies to come out. 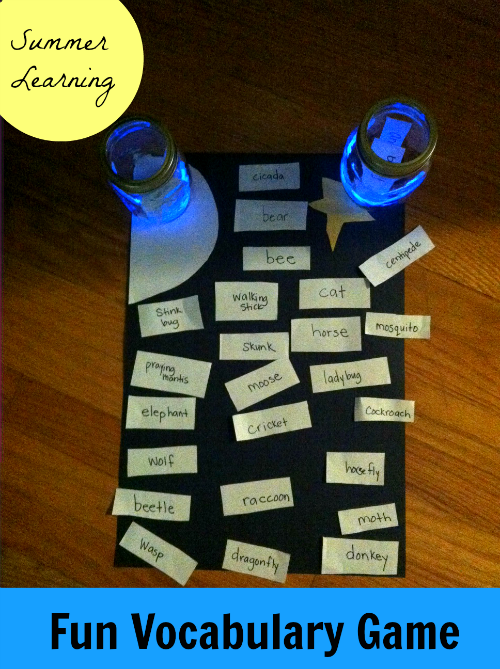 Once they do, dump the vocabulary words and use the jars to collect fireflies. Also, it's super fun to add glow sticks to the jars with vocabulary words... not for any educational reason, but just because glow sticks are fun. This is summer learning, it should be fun, right? After we played, we talked about the definition of insect. What makes us classify something as an insect. My super smart soon to be first grader already knew all about insects' three body parts and six legs. We were able to go through and firm up our knowledge about our sorts. In fact, Logan wondered if a centipede was, in fact, an insect. We checked it out and learned it is NOT an insect. Great conversations have a way of extending the learning! This game was inspired by an apple picking sort game that I found in the book Vocabulary Games for the Classroom by Robert Marzano and Lindsay Carleton. The version in the book involves a relay race with the sort. Since it was dark when we were playing, I decided to leave out the racing. There are several ways to switch up this game and make it fun and meaningful for children. Do you have a great idea to share for your favorite Eric Carle book? Link up your ideas here. Such an intriguing game with the blue jars, so fun! Thanks!